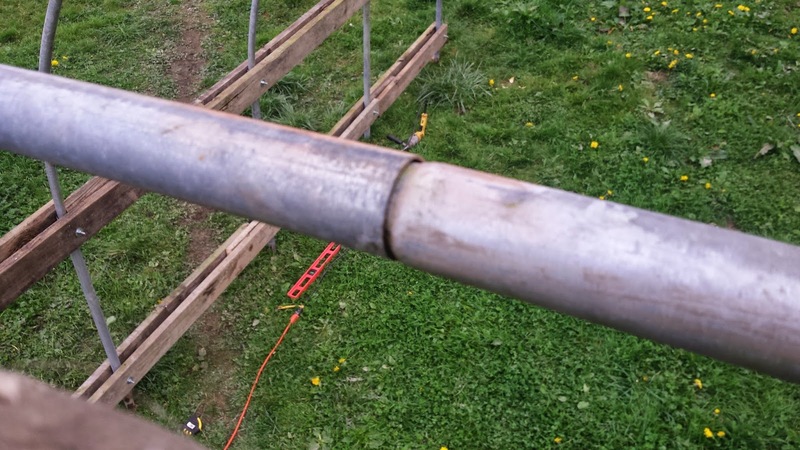 crowdfunding farm projects - good idea? 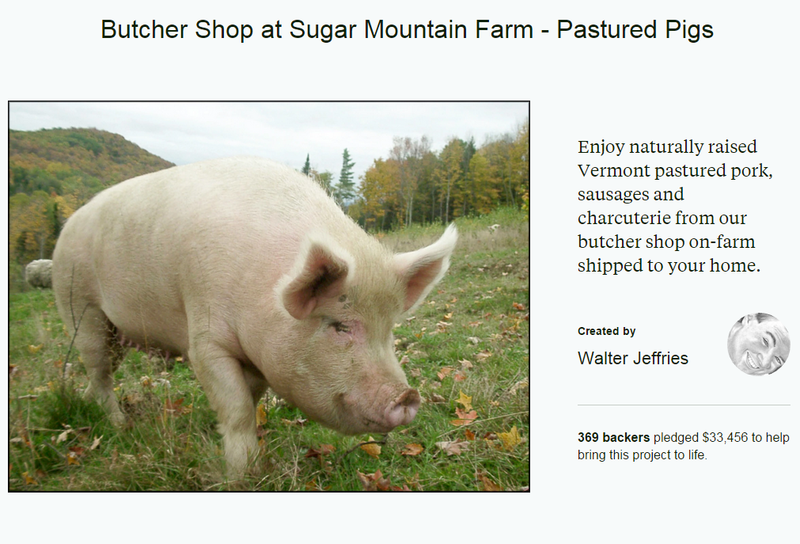 Two farms that I track have crowdfunded their projects; for the farmers in question I think that the funding was a good deal; for the public, if the expectation that the projects would help the local food situation -- not so much. Would I suggest that a farm seek crowdsourced money? In a word, yes. The barrier to funding is very low, and you aren't actually required to produce much, or anything. Getting financing from a bank is difficult for farm ventures, or for any new business, generally. Banks are primarily interested in making low-risk loans, as close to a sure thing as they can get, and they will typically require a business plan, proof of finances/sales, and even with both of those will usually require a lot of collateral to cover the money loaned. A crowdfunded source is a different sort of transaction; often trading on the perception of the farm, and usually with no proof of financials and no collateral. 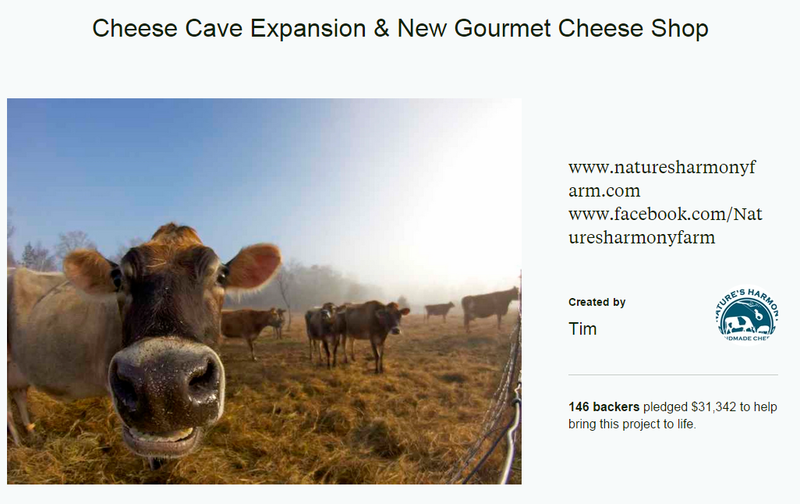 In the case of Tim Young at natures harmony, the promise made was to expand a cheese cave and to open a retail store, and they did both of these with great fanfare. A few months later the store is apparently closed, and the cheese cave is up for sale. Congratulations on getting funded! If I'm ever in Georgia, I'll make sure to visit your store. " A reasonable expectation of a crowdsourced campaign is that what they ask for will be enough to get them to where the business is viable and long-term. I know that when I contribute to one of these campaigns my expectation is that the business after the donation will be more viable than before my contribution. And I'm using the word donation here deliberately. Many of these kickstarter campaigns offer not much in return for the money. It's a feel-good exercise, but did it really help local food? Walter Jefferies is clearly struggling to complete this project. This project has been going on since at least 2008, and 7 years later it's not clear when it will be completed. With software projects a common way to "meet" a deadline is to remove features until you get to the current state of the project. 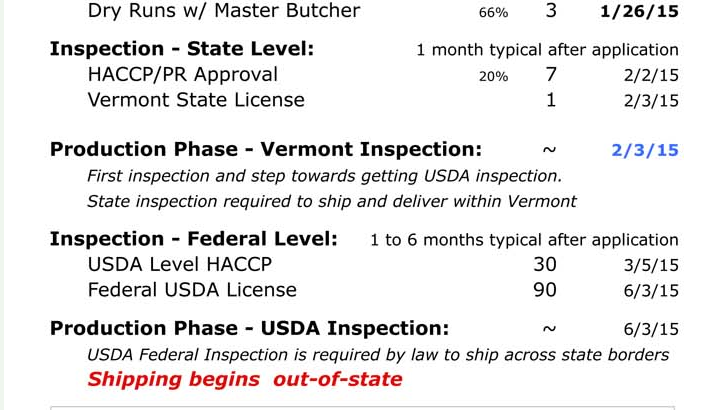 With this one you have at least two inspection organizations that have to approve the building, the State of Vermont and the USDA, and things have to be pretty much in place to have this go. For the last 7 years there's been an emphasis on the building that will house this venture; he's been building a monument out of concrete and steel. Watching this project grind on for 7 years now with no end in sight, I really have to wonder if Walter would have been much better off with an insulated pole building. I think that he would have been processing pigs years ago if he'd gone that route. There's value in having a hard-nosed lender check your figures and projections. In having a disinterested party look over your plans, and possibly even value in NOT getting funded. If you can't interest smart money in your venture, why would you want to invest your own money in it? the right-most column is "99.5% confidence". We're falling farther behind. Time will tell whether either one of these projects will pan out, but I have to ask: Are the people who funded them getting what they expected? 008 from bruce king on Vimeo. I spent the day today putting up a small hoophouse. It's where I'll start my vegetables, and later in the season I'll probably put hot-weather crops into it. Tomatoes grow pretty well, but we don't seem to get enough heat to make them red and lucious, so along with the peppers and the watermelon they'll be here. 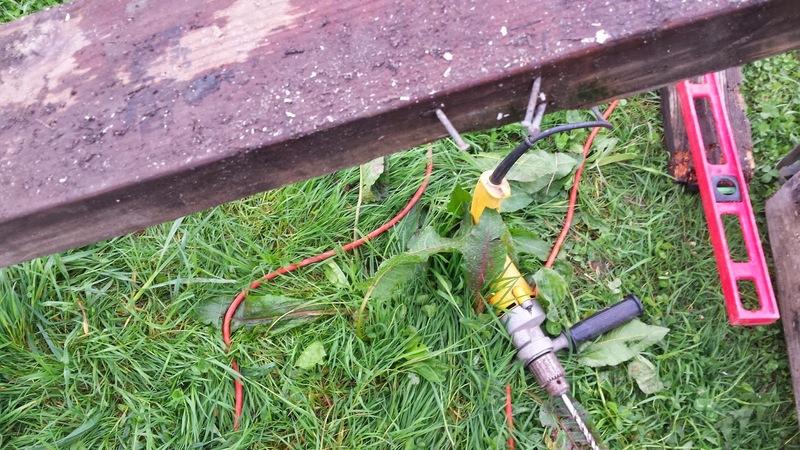 a heavier-duty pipe, about 4' long, that's driven into the ground with a fence post pounder. I do this because I want the greenhouse to be tall enough that I can drive a tractor in or through it, to make dirt delivery and removal easier, and just in case... well, i'm not sure why, but I've learned that if I don't make things big enough to drive a tractor into them that suddenly I have an urgent need to do so, usually involving saving time or work, and so now when I'm doing things I automatically add a little height or width or both. Once the hoops are up, I put a double-row of wood along the bottom and at the base of the bent part of the hoops. I do this because sometimes it's handy to be able to house animals in this, and if I provide that railing, I can just attach some 36" fencing and prevent the animals from damaging the plastic, or escaping. 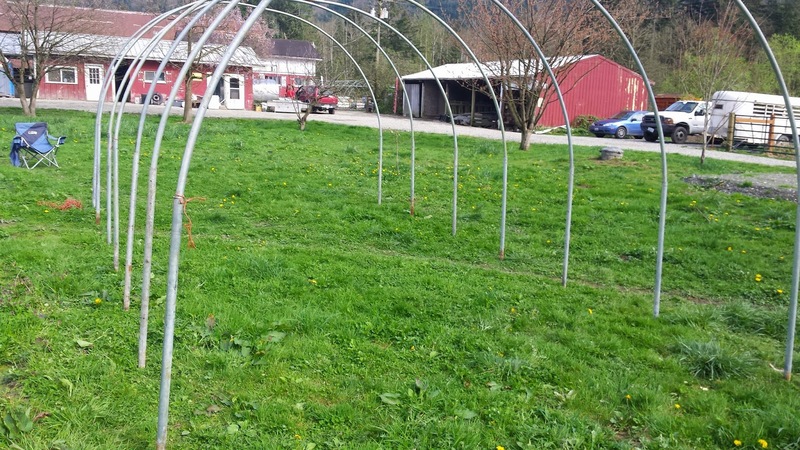 These hoop houses make pretty good chicken or turkey coops, or a place to stash a sick piglet or two, or a dog house, in a pinch. I'm using recycled lumber for this purpose; I try to keep and re-use any lumber that comes from projects or teardowns, and I spend a little bit of time removing the nails. 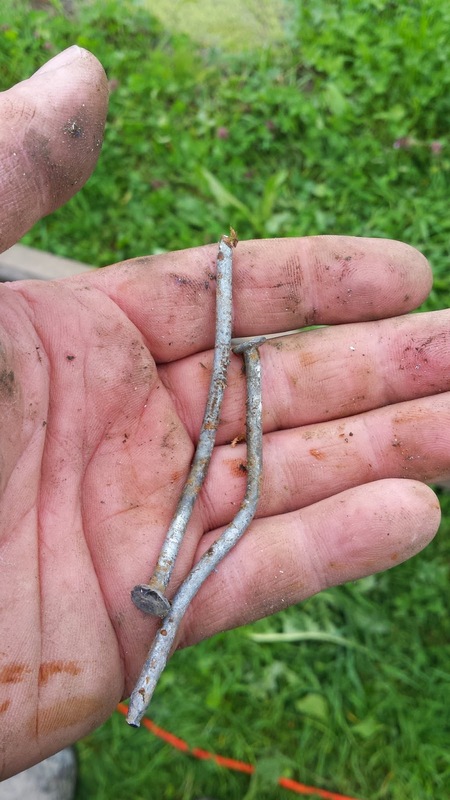 I wonder why people use galvanized nails, honestly. For this project I'd expect the plastic to last 4 years before it needs a new covering, and the wood will probably last 10 years (it'll be warm and humid, but douglas fir, which is what these boards are, is pretty resistant to it as long as it's not touching dirt, and these nails will probably outlive me. Plain old iron nails are used to join the boards. at the top of each hoop is the swage that connects the two pipes. 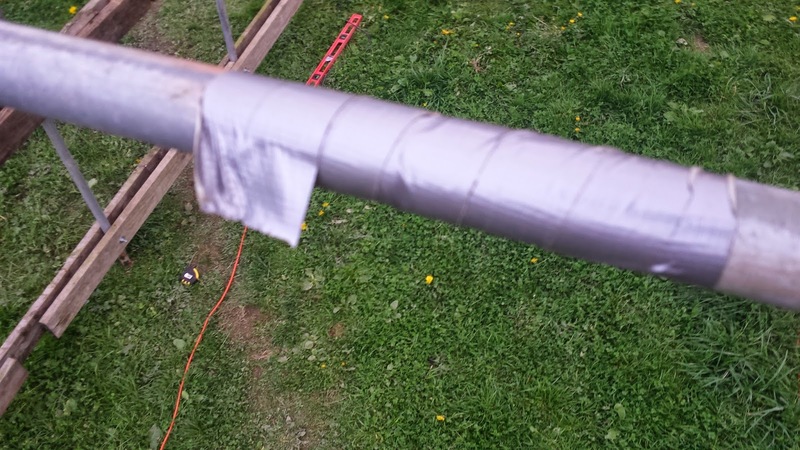 I've found that the lip on the pipe will eventually wear through the plastic cover, so I take a ladder and a couple of minutes and cover each of the 7 joints. With the double rail in (you can see top and bottom rails in the pictures above) and the joints taped, I'm ready to pull the plastic over the whole thing. This particular hoophouse is 15' x 28', with 7 hoops spaced 4' apart. It's a good size for a hot-climate kitchen garden. Cilantro, peppers, heat loving stuff that just needs a little boost above average to be sooo much better. Here's a link to a site that sells a pipe bending tool for $60. You an do the same sort of thing with wood blocks screwed to a piece of plywood in the arc you want to bend. What do you do when a homesteading forum steals your words? Who reads the TOS of a website that they use? I know that I don't often, but I sure am going to from here on. IP address, name, mailing address, email address and use of the Site, for its internal business and security procedures. " Now while a lot of websites may have terms of service that are like this, the new owners of carbon media decided that they'd actually do this. They were taking posts by users on homesteadingtoday.com, editing them, and then posting them as "original" content on other websites that they own. Most of the editing was just removing the original posters name and replacing it with "angie" or "pinkpiggy" or some other random username. No link back to the original. No attribution. Just plain and simple plagiarism. Carbon media is deleting the threads and discussions as fast as they can, and this attempt at a coverup is really making more people angry, faster. Honestly, as far as trainwrecks go, it's pretty good. I've been doing the research on running a dairy for a few years now, and raised and milked my own heifer and I've been slowly growing my cow herd; a few cows for beef, but the majority for use in a dairy. So now I'm at 24 head, with the majority of those being dairy heifers. I'm milking 4 of them twice a day right now - one holstein, two jerseys, and a holstein-jersey cross. Most of the milk is being used to feed calves, and I'm diverting 3 gallons a day to cheese making. Why cheese making? It's a way to sell milk, and it's a way to deal with surplus milk in a more shelf-stable way. With fluid milk you've got to sell it relatively quickly; with cheese, a few months of aging often improves it. If you're interested in the mechanics of cheese making, I'll talk about the stuff I'm using to make the cheese at the bottom of this post. I'm concentrating on fresh cheeses, that is, cheeses that are consumed relatively quickly, because that's what the market appears to want. I've talked to a couple of cheese makers and recently took a 3 day course in cheesemaking offered by the local agricultural extension, and what is selling for local cheese producers are these sorts of farmstead cheese. Plus I like to eat them. I've made 40 wheels of this type of cheese and kept careful notes about the ingredients and handling of each. Each batch of 3 gallons of milk made 3 or 4 cheeses (I varied the size a little so that I could see how they ripened if they were a little bigger or smaller) and so I'll get to try each batch at 3 ages. one relatively young (2 weeks) one midrange (4-5 weeks) and one ripe (6+ weeks). The actual cheese making process is a lot like baking crossed with brewing beer. You're dealing with live cultures, and the trick to it is to provide the right conditions for the culture you want to encourage and have that culture crowd out all competitors. The farmstead feta is one of the favorites. It's relatively simple to make, doesn't have to age very long at all (fresh it's very mild, two weeks old it's got a little bite, at 5 weeks it's sharp) and it has become the household snack item. To heat the milk and maintain the temperature on cultures or for cheddaring, I use a sous-vide water oven. You can do the same thing with a couple of pots and a thermometer, but the sous-vide makes it pretty easy to get fairly precise control over your milk and culture temperatures, and in a pinch, can be used to pasturize your milk if you'd like. (set to 145 degrees and maintain at temperature for 30 minutes). For my cheese experiments I'm using all raw-milk. I'll warm the milk to temperature and then transfer to 3 gallon plastic totes for incubation of the culture and for curd formation. I started with this recipe for the camenbert because by the time that it's all said and done, my mostly-jersey milk produces either a double-cream or a triple-cream cheese. Plus that's one of my favorite types, so why not make something you like to eat? Who says experiments have to be all work! With the feta cheese I used a recipe supplied in the cheesemaking class. The basic ingredients are whole milk, culture, lipase, rennet, salt. and use a little less rennet. On a flavor note, there is a distinct flavor difference between raw-milk cheese and pastuerized milk cheese; having grown up with pastuerized milk, I'm finding that the raw milk cheese is particularly delicious. how many acres to feed yourself? I think one of the things that people think about is becoming food self-sufficient. that is, to raise your own food, and feed yourself from your own land. "How much land would you need to feed yourself"
Takes about 2lbs of feed to put a pound of weight on a chicken. For a chicken you add about 5lbs = 20lbs of feed. which means about 20 pounds of grain per chicken, which means half a bushel or so. Current grain yields are between 30 and 40 bushels per acre, which means for each chicken you'd need 1/60th of an acre of grain. Want to eat a chicken a week? you'd need an acre of wheat. But what would it take to get that acre of grain? 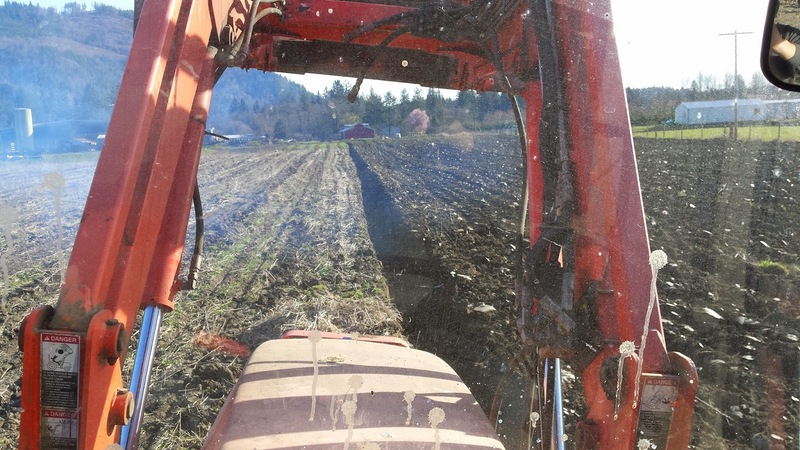 With a modern tractor, you could till and prepare the seedbed on an acre in a few minutes; at a cost of $150,000. With a mid-sized tractor it may take you an hour, at a cost of $65,000. With a horse and a plow, maybe a day. By hand, with a hoe, a week or two if you worked 12 hour days. Seed would cost you $12-14 per 50lbs, and you'd need 150lbs for the acre. Putting the seed in the ground you'd need a grain drill (used, $800) or you could broadcast seed it (broadcaster, $800) and then disc it in (8x10 disc, used, $1200) and then you'd be all set to watch it grow. To harvest it with a modern combine would take a few minutes ($500,000) or you could buy an older one for any price point you want (499,000 to $3k) depending on the decade you're purchasing it from, and it would take a 10 to 40 minutes. Or you could go out with a scythe and cut shocks of wheat down, and dry them, and hand-thresh them and it might take you two weeks of pretty hard labor, threshing and winnowing and drying the wheat. And then you could store that wheat somewhere so that rodents didn't get it; maybe a nice grain bin, or metal garbage cans in a pinch. Then you can feed it to the chickens, and watch them grow, and when they're the size you want, you can process them and eat them. So how much land for your chicken dinner? an acre. But the real question is how much would that chicken dinner cost you? I've written about natures harmony a few times over the years; Tim Young has put his farm back on the market, this time listing it for $800k. that's down substantially from his initial asking price of 1.5 million, but it's still not what I'd say is market price in his area. He built a 5,000 square foot brand-new house, which for a farming venture is overbuilt; the median house sale price in the area is $50k. 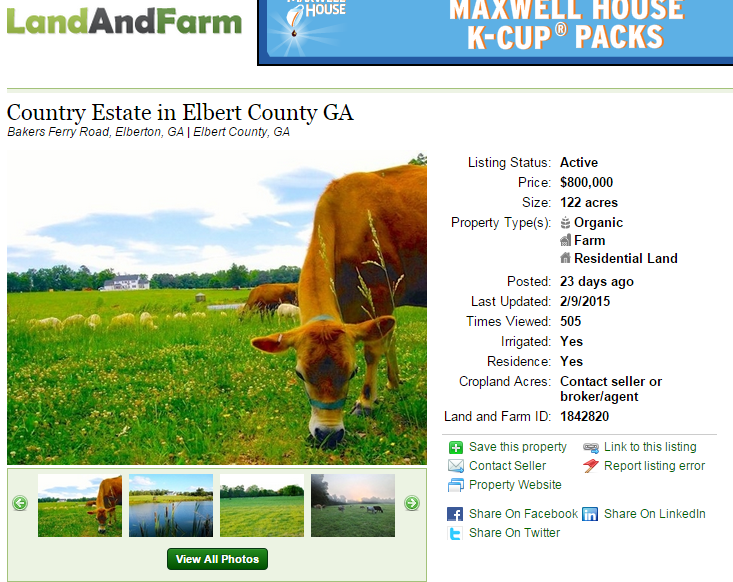 He does have 126 acres, which is probably worth... well, judging by land sales in the nearby area, around $300k. Tim has for years touted his farm as sustainable and claimed a free cash flow of $10k a month; he's written how great farming is... but he's been remarkably quiet about trying to sell the farm. My best estimate is that he's spent about a million bucks on the farm and various ventures over the past 5 years. It's a little bothersome that he just finished a kickstarter campaign and immediately goes to sell the farm. 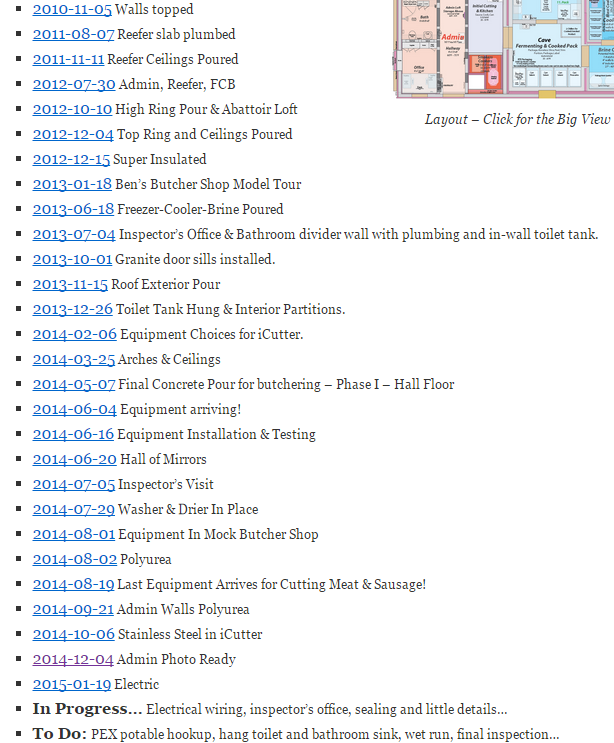 I'd like to think that when I kickstarter something that they're going to make a good effort to using the new facilities for the forseeable future. The "gourmet cheese shop" is apparently closed, after having been open for what looks to be 3 or 4 weeks. Here's my little boost to finding him a buyer and moving him on to his next venture. Best wishes to you, Tim. 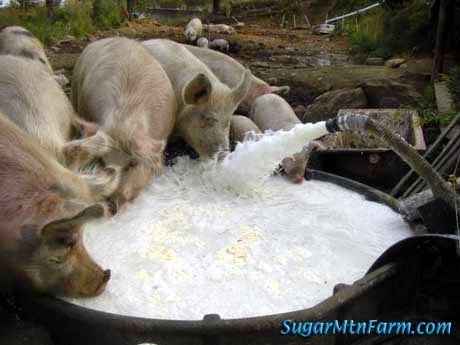 I've been raising pigs primarily outdoors for the better part of the last decade, and I've read a lot of people who "pasture" their pigs, and there's some of those folks who claim that the pigs get all of their dietary needs from "pasture". I'm writing this post as a summary of a decade of experience. 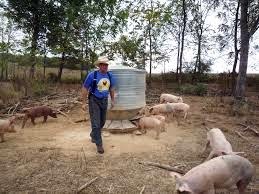 One of the biggest proponents and advocates of pastured pigs isn't doing anything like managment intensive rotational grazing, despite years of claims to be doing so; in my opinion. His farm name and blog are on the photos I'm using to illustrate this post, and he's welcome to say whatever it is he'd like in response, but I think you'll agree that discussion of farming practices is best when you get all sides of the issue. one of my sows grazing on my alfalfa from Bruce King on Vimeo. The first thing to do is talk about what people mean by pasture. I've visited a lot of farms over the last decade; more than a hundred. 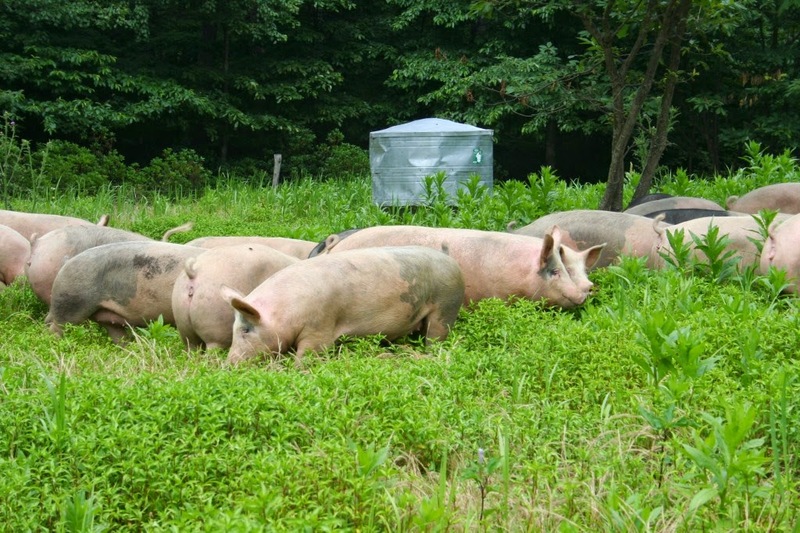 Pigs, when they're kept outdoors, have had areas that ranged from bare dirt and rocks to lush growth, and in every case the farmer called it "pasture". For the purposes of this discussion I'll talk about pasture as being any outdoor area that is used to raise pigs; it may contain trees and brush, or be grass or a planted crop like alfalfa, or it may contain a mix of different plants or it may have no plants left there at all; bare dirt and rocks. "pasture" is any outdoor area where you keep pigs while you're raising them. There's no minimum size for "pasture"
There are no minimum size qualifications for "pasture". I've heard people refer to a 20x20 pen as 'pasture', and I've heard others refer to 70 acres as 'pasture'. What does Management Intensive Rotational Grazing (MIRG) mean? 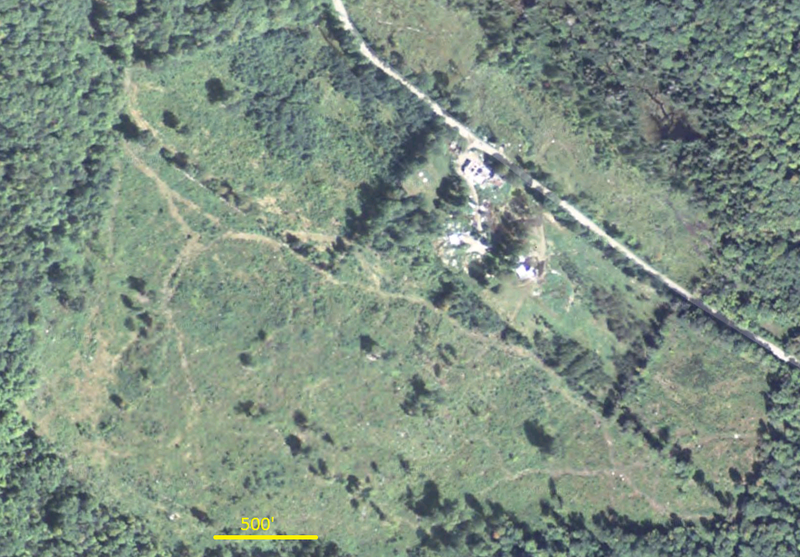 MIRG describes a system of moving animals over the land, allowing them to consume some portion of the vegetation there, and then moving the animals to another spot, allowing the vegetation to recover from the grazing. The theory is that confining the animals to a small portion of the land, the plants that the animals like are consumed, and those that they don't like are either trampled or manured to death. Once the acceptable level of grazing has occured, you move the animals to another area, and you want the rest perioed between visits to be long enough to break parasite lifecycles. An additional theory is that you can improve the effects of this rest period by putting different kinds of animals out in successive waves -- cows first, for instance, and then chickens to scratch apart the cow patties for the fly larvae which would otherwise hatch and bother the cows. An additional benefit is that you are able to control where the animals spend their time. Generally speaking critters will hang out in areas of your land that they prefer -- a shady tree, or nearby a water source, and those "camps" become areas where parasites thrive and re-infect the animals. Presenting new, parasite-free ground reduces that. It's an attractive scenario -- appealing to those folks who want to think that t hey're recreating the grazing of large herds of herbivores, and replicating natural pest control. For a variety of reasons, if you visit a livestock forum you will often find many discussions of this form of land management for livestock. Why is it "Management Intensive"? This term refers to the amount of work that it takes to actually do this sort of management. Traditionally in the USA most cattle are managed on a "free grazing" system. This basically involves putting a perimeter fence around the land, and then turning the animals loose in that area to graze whereever they want. 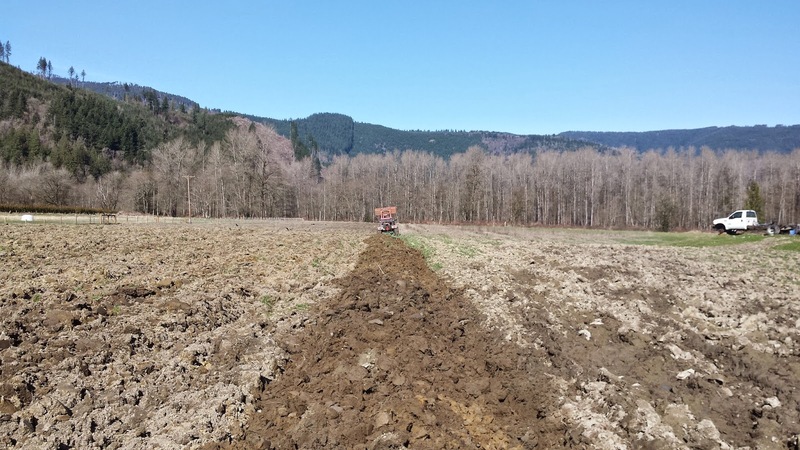 If a farmer is going to practice this form of pasture management they can not use fixed, permanent feeding or watering stations; they must either have a lot of interior fencing, or the ability to temporarily fence smaller areas to restrict access. More to the point, they've got to move all of the equipment for the animals each time that they move the animals, or provide new equipment at every new paddock. Fixed feeding and watering stations rapidly become the center for parasite infection, and often will show intensive wear and tear on the vegetation. Very often they become bare earth or mud. In addition to moving the fencing, equipment and animals, the farmer needs to keep a close eye on the vegetation itself, and to learn and work with the growing season of their farm and land. For most of the world there's a part of the year that plants don't grow; out of the standard growing season it doesn't matter if there's a 6 month rest between grazing if it's too cold, or too hot, or too dry, or too wet, for plants to grow. You're moving animals, fences, equipment and water, and you're doing so on a semi-random basis based on how fast the animals eat the vegetation that you provide. That's why it's called Management Intensive. It takes your time and attention. How much vegetation can you graze off before you move the animal? For most proponents of rotational grazing systems, one simple way to tell if you've taken too much is when you see bare dirt. Bare dirt means that all of the above-ground plants are gone, and probably some of the roots, too. Taking grazing down to the bare dirt means that the plants will have a harder time recovering, take longer to recover, and generally speaking it means that the favorite plants of the grazing animal are usually completely eradicated; weeds grow faster and larger than palatable plants for the most part. That's whe they're weeds. I have grazed down to bare dirt intentionally, but only do so in areas where I have a special need or project. for the most part I want vegetation on every inch of every acre, for reasons I'll talk about below. How much vegetation do you leave? 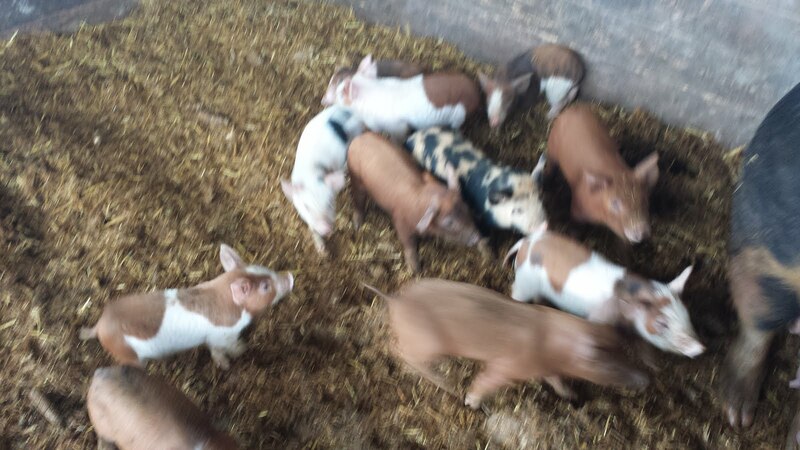 I like to leave 4 to 6" of growth when I move my pigs to a new area, but the precise amount will vary from farm to farm, from species to species. My cows, for instance, will naturally stop eating and move to a new spot when it's less than 6" tall, if they've got a choice. If you're farming you can develope the skill to measure your grazing and its effects on your land -- remember "management intensive"? This is where your time and attention go, at least initially. You'll give them larger areas and smaller and over time will get a sense of what they can consume and how long it takes them. But the key issue here is NEVER bare dirt in the normal course of grazing. To be absolutely clear here: I have areas on my farm that are bare dirt; I don't like it, and I work hard not have them, but they do happen. But I am also making NO claim to be doing MIRG, nor am I proposing that other farmers take up that practice. Properly done, it's a lot of work, and honestly, I've got a lot of other chores first; most farmers do. 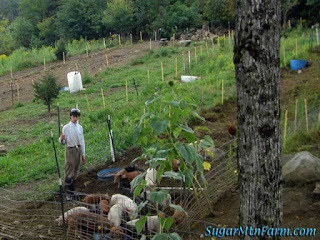 Here are some pictures of various "pastured pig" operations below. I'd like you to look at the pictures and see if you believe that they're actually examples of "management intesive grazing". there's a comment about each picture at the end of the list. Picture #1 shows what appears to be a permanent feeding station. Note large amounts of bare dirt and minimal vegetation. Most MIRG proponents would say that this area is overgrazed. Picture #3: Small paddocks are good, but most of them show either bare dirt or minimal vegetation. Most proponents of MIRG would say that the majority of these paddocks are over-grazed. Picture #4: Fixed, permanent feeding station. Notice permanent animal paths on bare dirt leading to and from this feeding station. Picture #5: Does this look like rotational grazing? Picture #6: Unlike cows and other ruminants, pigs do need mud as protection from the sun and insects and overheating. Bare dirt is hated by MIRG proponents, but is needed as part of an outdoor pig operation to allow the pigs to manage their own temperature.